If you have been diagnosed with psoriasis, you may be wondering exactly what is psoriasis. Psoriasis is a hereditary skin disease. It is not contagious. It is also not curable. You can treat the symptoms to lessen the severity and frequency of outbreaks, but be prepared to live with the disease for the rest of your life. Some scientists and physicians have linked an increased risk of stroke to psoriasis, but for the most part, there are no serious health risks involved. Patients, however, suffer serious shame and embarrassment. Even though there are millions of people living with this disease, many never seek treatment. a day or so, dead skin cells build up over the spot. These patches usually appear on your elbows, shins and scalp, but can crop up anywhere. Guttate (from the Latin word drop) – appears as small drop-like spots, usually on the upper body, arms and legs. These spots are typically not as thick as the ones seen with plaque psoriasis. Outbreaks are associated with stress, strep throat, respiratory infections and the use of certain medications. Inverse psoriasis – is commonly found in the sweaty regions of the body, like armpits, under breasts and the groin area. Due to the tender location of the lesions, this type can be extremely uncomfortable. Pustular – mostly seen in adults, this type appears as white blisters surrounded by reddened skin. 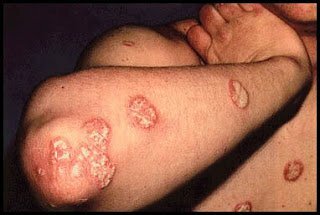 Pustular psoriasis has been divided into three sub-categories: Von Zumbusch, Palmoplantar pustulosis and Acropustulosis (acrodermatitis continua of Hallopeau). It may appear only in certain areas, or cover the entire body. Erythrodermic psoriasis – is considered particularly inflammatory and can affect the entire surface of the body. It often occurs along with Von Zumbusch psoriasis. Unlike with the other types, the dead skin cells shed in sheets instead of flakes. The sufferer often experiences itching, severe pain, an increased heart rate and fluctuations in body temperature. A severe flare up requires immediate medical attention as other complications could arise. The general belief is that psoriasis is hereditary. One or more genes passed down can create a predisposition to the disease. Like other genes, these can skip generations or only pass on to some of your children. However, some researchers believe that psoriasis has specific causes they call triggers. As with most unexplainable conditions, these researchers blame everything from stress to diet. None of these theories are supported by any concrete evidence. Treating Psoriasis How you treat your psoriasis depends entirely on which type you have. One treatment will work great for one type, but worsen the condition of another type. For example, exposure to UV rays worsens Erythrodermic psoriasis, but practically erases plaque psoriasis. Since the major symptom is flaking skin, your first reaction will be to moisturize. Again, this works for some types, but not for others. The moisturizer you use also plays an important role. Some moisturizers contain a lot of alcohol. These may work on some of the types, but should never be used to treat plaque psoriasis. However, coconut oil and soaking in epsom salt does magic for most types. Although there is a lot of research going into the treatment of psoriasis, it is not a life threatening disease, therefore not at the top of the priority list. A lot is still unknown about causes and cures. Ask your doctor exactly what is psoriasis and how you should treat your particular symptoms.